Chris Rosebrough of Fighting For the Faith, Letter of Marque and Museum of Idolatry has written a great article (How To Hear God's Voice 100% Of The Time) about how it is that we "hear" from God. So the obvious question must be asked: How do Christians hear from God? Is it through random-Bible-verse-reading? (what I call the Ouija board approach) Is it from seeing signs in nature? 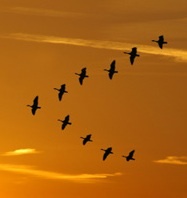 (I have a complex problem, and suddenly I see geese flying in a V formation....that must mean I will have Victory over my problem!) No, this is not how we hear from God. Until recently, the traditional orthodox view for Protestant Christians on how it is that we hear from God is through the study of his Word. It's not complicated, really it's not. But in our postmodern, fast food, experience-driven culture, this is not "enough." Mysticism is in, Systematic Theology is most definitely out. We want An Experience that we can point to, something Tangible. Are you struggling to figure out if those whispers that your pastor has told you to listen for are really God's voice or a case of gastrointestinal hallucinations caused by a bad batch of pepperoni pizza? Are you tired of going through the whole rigamarole of filtering those voices in your head through a six point 'discernment grid' to try to ascertain if that's the Holy Spirit speaking to you or proof that you need to make an appointment with a shrink? Have you read and reread (Henry) Blackaby and still haven't got the foggiest notion as to how to tell where God is working in the world so that you can join Him? If you've answered yes to one or all of these questions then I've got great news for you! I have discovered a simple and sure fire way for you to hear God's voice. The best part is that its 100% guaranteed and totally Biblical. If you do not have a Bible then you can read it for free on the internet at Bible Gateway. I recommend the English Standard Version for both readability and translational accuracy. Read it with your mind engaged. Pay close attention to grammar and context. Take notes. Set a goal to read 3 to 10 chapters per day. If you do those three things then you will be hearing God's voice every single time that you open the Bible. No guess work, no need for six point 'discernment filters' and no nagging uncertainty about whether your hearing God's voice or something else. How can I be so sure and certain that this works.....? Continue reading Chris Rosebrough's excellent article here. Just Do Something: How to Make a Decision Without Dreams, Visions, Fleeces, Open Doors, Random Bible Verses, Casting Lots, Liver Shivers, Writing in the Sky, etc.